And now I leap off into a topic in which I am not properly trained: molecular biology! You sometimes get the impression that scientists lead dull lives because they over-analyse things, they’ve lost their sense of wonder. The thing is: the more you know, the more you wonder. As every chemist kno carbon (C) atoms are black, nitrogen(N) atoms are blue, oxygen(O) atoms are red and hydrogen (H) atoms are white. (Not really but those are their traditional colours in molecular models). Isn’t it beautiful? You can play with an interactive version here. In real life chemistry is more messy than this which is why I’m a physicist rather than a chemist. 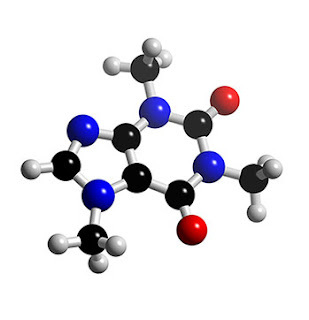 The caffeine molecule is about 1 nanometer across, 1 (US) billionth of a meter. To give you a feel for the size of a nanometre: think of a grain of rice – about 1mm across, now imagine a kilometre. Walk your kilometre with the grain of rice, I walk a kilometre in about ten minutes and it takes me past two roundabouts, a gym and a postbox. Now look at you grain of rice again. To a caffeine molecule, a grain of rice is a kilometre wide. Molecular models of this sort are a representation of reality, the things they miss out are: (1) in real life molecules are not static, they’re jiggling away furiously through the action of thermal energy (2) generally they’re going to be surrounded by solvent molecules (often water, which are also zipping and wiggling around) (3) they’re sort of soft, fuzzy and deformable and different parts of the molecule will be sticky or slippery according to their chemical nature. 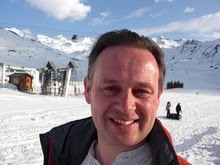 Ten years ago a good question at any molecular modelling seminar was to ask about the solvent molecules, the usual answer was “there aren’t any” – this usefully puts molecular modellers in their place since we’re rarely interested in molecules without solvent. Perhaps things have moved on since those days. Life specialises in bigger molecules than caffeine, exquisitely crafted into little machines. And the incredible things is that all of life (humans, mammals, reptiles, birds, snails, bees, tardigrades, sponges, plants, algae, bacteria, fungi, weird bacteria that live in hot underwater vents) share the same 4-letter DNA code, which codes for the same set of 21 amino acids which build all the proteins to make life. Many of the proteins themselves aren’t hugely dissimilar across all the plant and animal kingdoms, particularly those to do with the most basic operations (processing DNA, converting food to energy). Proteins are strings of amino acids: each different type of protein has a different sequence of amino acids. 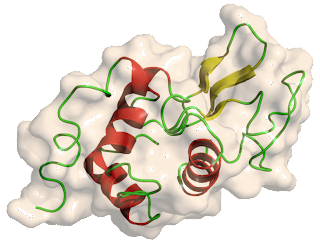 This is a model of lysozyme, the alpha-helices are shown in red and the beta-sheets are yellow, bits of “random coil” amino acid sequence are shown in green. Lysozyme is about 5 nanometres from one end to the other. You can play with an interactive version here. The amazing thing about proteins is that their 3D structure forms spontaneously and very rapidly when they are synthesised in the cell, this process is known as ‘folding’. Furthermore the folded, or tertiary structure, of the protein is the same every time – it has to be or the protein won’t do it’s job. One of the great challenges in molecular biology is that, despite knowing the amino acid sequence of a protein from the DNA which encodes it, working out the 3D structure is a question of measurement, or comparison with other sequences of known folded structure. Lysozyme is a physicist’s protein, you can buy it in bottles by the gram. I’ve worked on lysozyme, looking to see how it unfolds on a surface when heated. Green, R.J., Hopkinson, I. & Jones, R.A.L. Unfolding and intermolecular association in globular proteins adsorbed at interfaces. Langmuir 15, (1999), 5102-5110. Wonderful and mind boggling. Had to laugh out loud when I clicked on the Caffeine molecule link and as it loaded up I noticed it had a little Java animation. Hmm my favourite provider of caffeine molecules. Java (the computer language) has sunk so deep into my consciousness that I missed the irony!